Ever thought that regular Lego blocks would be way cooler if they could do more? 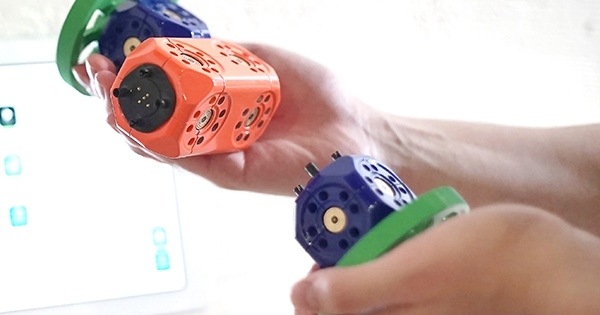 Then check out Robo Wunderkind, a modular toy based around a system of programmable (and colourful) cubes, that you and your children can tinker away with for hours. The cubes have a range of cool gizmos built into them, including light, proximity and infrared sensors, cameras and even laser pointers. There are also wheels, dummy cubes and Lego-compatible adapters available. Simply snap the cubes together and build whatever robot takes your fancy. Then programme (and control) it via an app on your smartphone or tablet to drive around, forecast the weather, play music…how cool! The Wunderkind project is still in Kickstarter phase, where $149 gets you a basic kit (servo, proximity sensor, wheels, connectors and Lego adapters). A $249 pledge gets you an LED display, light sensor and meteo sensors, while a $499 pledge comes with an extra infrared sensor, laser pointer, camera, accelerometer and e-ink display. Robo Wunderkind is due to ship July 2016.